A legacy from St Lawrence Lodge member, Trevor Portlock, could possibly save your life! 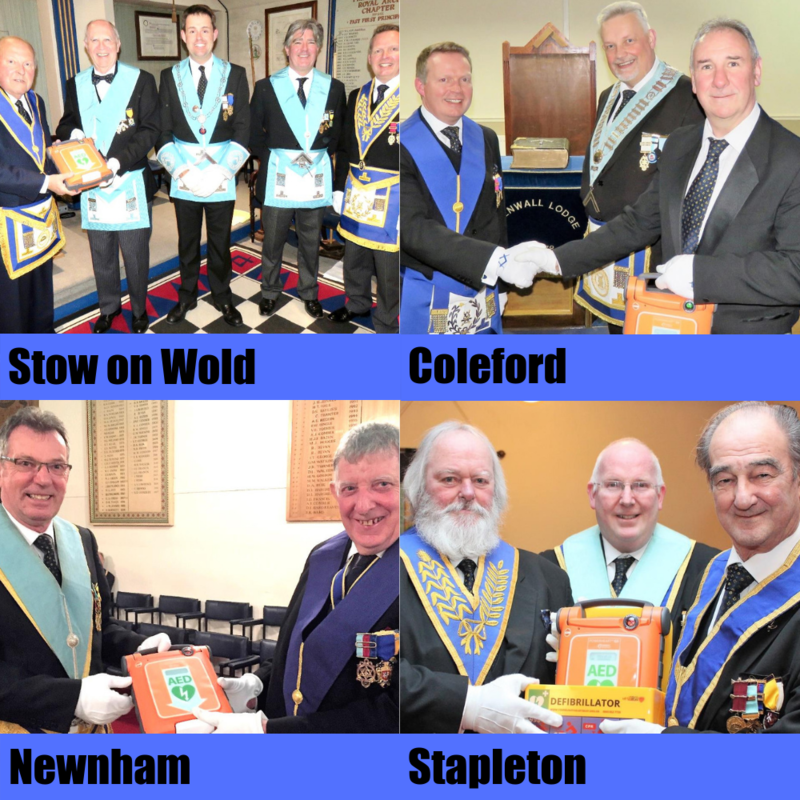 The money he left to Gloucestershire Masonic Charity Action (GMCA) is being put to good use; certain masonic centres across the Province are being equipped with defibrillators. Locating a defibrillator at the centres was the initiative of David Sullivan; aware that the chances of surviving a heart attack are increased by 50% when a defibrillator is deployed. He put forward the proposition to the GMCA and the programme swung into action! “I invited David Sullivan to Kingswood Chase Lodge,” said GMCA Trustee, Mark Smith, “so he could present the first ‘Portlock’ defibrillator to Ivan Vine, who is the Chairman of the Hall Board at Staple Hill hall in Downend. “The Lodge was called off and I was given the opportunity to give a brief summary of Trevor’s interesting life and the generous donation he made to the GMCA in his will. In partnership with the Community Heartbeat Trust, this has provided funding for a total of five defibrillators at Staple Hill, Stapleton, Newnham on Severn, Coleford (Edenwall) and Stow on the Wold. It is also planned to donate a further seven defibrillators to community projects across the Province in memory of Trevor for the benefit pf the public at large". .
Will Durman (the new GMCA Chairman), Ivan Vine, Dave Sullivan and Mark Smith. “The units are really easy to use,” agreed Mark. “The simple visual and audible instructions were demonstrated to the members present. However, full training at each centre will be delivered by the Community Heartbeat Trust at dates to suit the individual centres. Trevor Portlock was an only child. He was born in Birmingham in 1923 and on leaving the Grammar School there, he joined Birmingham City Council as a trainee accountant. At the outbreak of WWII, he joined the British Army and ended up in Greece, operating a secret radio reporting on German troop movements. He donated his army dagger to the lodge. It is now used as the poignard at the door at Stroud. After the war he retrained as a food inspector, which led him to join Stroud Council as a public health inspector. It was there he met Cliff Howell, a member of St Lawrence Lodge. Cliff proposed Trevor into the lodge. He was initiated in 1965, becoming WM in 1974. Trevor was a keen cyclist, travelling all over the country. His wife, Mary, died in 2010. They had no children.